Sayer’s book is a pleasure to read, luscious in a sultry kind of way… Sayer meanders voyeuristically into the affairs between Franz Kafka and Milena Jesenská, Alma Mahler and Oskar Kokoschka, Leoš Janáček and Kamila Stösslová, and tarries alongside the ménage à trois of Éluard, Gala, and Max Ernst. The Vogue model turned photographer Lee Miller makes an appearance, as do the singer Jarmila Novotná, the architect Le Corbusier, the “little girl conductor” Vítěslava Kaprálová, and the Nazi filmmaker Leni Riefenstahl. The axis is Prague–Paris, but we detour to Vienna for Expressionism, Berlin for Dada, the Moravian town of Zlín for the Bata shoe factory. 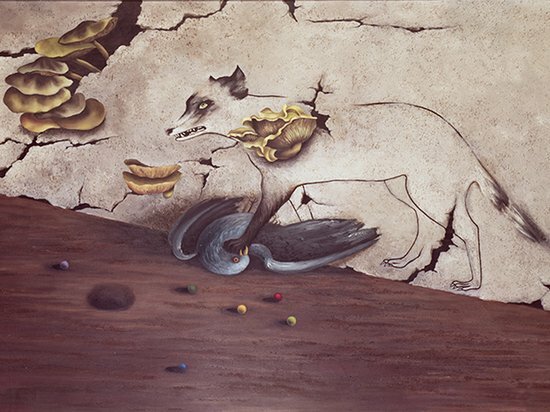 While Sayer lingers at length among Surrealist erotica, he disapproves of the Surrealists’ “propensity to parlay the sordid into the sublime”. Prague itself – krásná Praha, zlatá Praha (beautiful Prague, golden Prague) – has long been eroticized, but Sayer finds the city’s sexualization tawdry. For him, Prague is the laboratory where Éluard’s belief that “everything is transmutable into everything” is confirmed. “This little mother has claws”, as Kafka wrote of his own city. The fairy-tale picture of the castle overlooking the river conceals the necrophiliac and the sadomasochistic, and images of the pre-modern grotesque flicker across Sayer’s Surrealist narrative … If for Benjamin Paris was the capital of the nineteenth century, for Sayer Prague was the capital of the twentieth: “Prague is a less glittering capital for a century, to be sure, than la ville-lumière, but then it was a very much darker century”. Thank you Professor Shore for a very generous review! 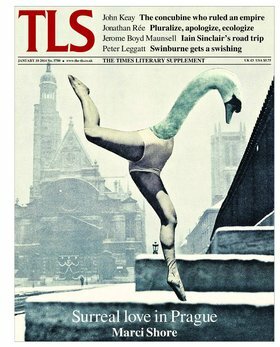 I am also really pleased that the TLS chose to illustrate “Surreal love in Prague” with Toyen’s painting “At the Château Lacoste” (below) and to use one of Karel Teige’s surrealist collages for the magazine cover (above). The full text of Marci Shore’s review can be found here.